This is the year I flunk out of Nano. Yes, it's true. I like the idea of winning, of pushing through those fifty thousand words and putting them up on the website. There's something so satisfying about seeing the little word counter fill up. But that won't be happening this year. I've accepted it. I could give excuses. I have work, I have family, and family and family..... But that's not it. No, it's that my story wants to do something else. It wants to be more than the simple if A happens, then B will happen and that will cause C story. It wants to require more thinking, and more careful writing. Sigh. Damn it. Careful writing is hard. So I've slowed down. I've added characters. I have even been thinking about putting some of it on this blog for you all to tell me what you think. Narin unlocked his door and sat down on the couch, reaching for his acoustic guitar. He chorded it softly, fingers just ghosting whispers from the strings. He didn't want this, especially not now. His fingers wandered to minor chords when he thought of James. 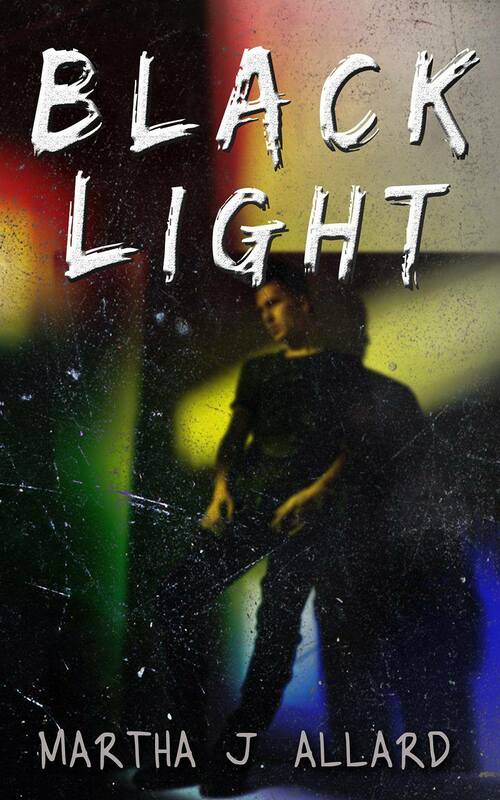 He had a darkness all his own that Narin couldn't help wanting to save him from. He barely noticed his fingers slowing, growing heavy. His eyelids began to close, despite his struggle to keep them open, and the paralysis in his fingers crept through his arms to the rest of his body til he felt as though he was made of stone. No, he thought, just barely able to keep his eyes slitted. The guitar was gently teased from his hands, and his narrow strip of sight was filled with his Lord's razor cut glass features. It wore a beautiful human glamour. Somewhere in Narin's mind he thought that made perfect sense. It had dressed for the occasion. Narin tried to raise his arm to defend himself, but he couldn’t move now. “Don't.” he forced it out. Narin saw the colors of it's words change from clover honey to thousand year old amber. His Lord leaned close enough to feel it's breath on his face. Narin tried to struggle, but he couldn't even scream. So, Nano this year gave e stuff like that. I guess I can't really complain. Let me know what you think. It's November, and I think we all know what that means. Yes, it's the beginning of the holiday retail season, and Nanowrimo. Two things that I don't really look forward to. Why not? Well, holiday shopping makes me feel, as Charles De Lint says, "Laid low by an ill will." All I can really do is try not to make it my ill will. This year is my twentieth Christmas at the bookstore and the last few have been killers. But a day job's a day job, right? And if I had to sell shoes, or pet food, how much more awful would it be? At least this way I get to touch books. And Nano? Well, it's November, isn't it? It's dark when you get up at four am to get your pages in. And cold, actually. So why do it? Because I need to finish things. Because I need to get stuff done and moving out of my hard drive. Nano makes me crazy because of the pressure of a fake deadline, but it also gives me a goal that's out side of my head. So let me tell you about my Nano project. Iron Moon. Werewolves and fairies. More later on that. Because I should really get some words in.... Right? I just realized that this will be the first Halloween without Ray Bradbury, who died earlier this year. I have been thinking about him, because this autumn has been very much like the autumns we used to have. The leave began to flame as soon as October came. I wasn't prepared. Global warming, or climate shift, or both has me almost used to ninety degree temperatures in September, and made snow in winter a rarity. This fall is different. It's been cold enough, of and on so that I've considered turning the heat on. Yes, you heard me. Heat. We've days and days of leaden skies and cold rains. The wind has knocked the color off the trees and made the front hall of my house moan at night. At least I hope it's the wind. We've had a Something Wicked This Way Comes autumn. In the book, Bradbury describes what a mid-western autumn looks like, smells like and feels like perfectly. Fall in this part of the country has a particular kind of light, low and slanted somehow, that makes everything look out of kilter, slightly dangerous. The small town that I grew up in always decorates its block-long Main Street for holidays. This year they tied corn stalks to the street lamps. And to the corn stalks, they tied scarecrows. I parked in front of the coffee shop, and looked up into the eyes of a scarecrow with a potato sack mask painted with a leering jack-o-lantern face, his arms spread wide. I found myself stepping as far out of his reach as I could. It just seemed like good sense. In that low light, under the overcast sky, I had, just for a second,the feeling that the town was holding its breath, waiting for the storm. Waiting for Mister Dark to come strolling around the corner, carnival in tow. So I can't help thinking that this perfect, surreal, creepy fall is entirely for him, just to remind us, to say goodbye. The reading went well. We had a small audience, but a good one. Each member of the workshop read well too. We had four vastly different stories which was great. There was a piece about knowing that there is something there in the dark that isn't in the light and going there anyway. Patricia read one about a woman who finds out what she must do to protect her child. Nancy's story was about being a child learning to be alone, and then not. Mine? Well, you already know what mine was about. Is about.... For the moment, anyway. The big surprise there is that I am becoming fond of the story, which makes me feel a little good. But, as I said, the reading, though small, was a success. I hope that the next time (I'm still trying to decide if I want to do a next time), but the next time, there will be more people. When I talk to other writers, I'm always surprised to hear that, yes, they're married, but no, their spouses (husbands, I've not really talked to many men who've said this) have never read anything they've written. Maybe surprised is the wrong word. It makes me sad. How do you marry someone that you haven't met. Because really? If you haven't read my work, you don't know me. But before you think I'm bashing men, let me say, that I don't believe that all husbands/partners are left out because they choose to be. I think that we, as writers are afraid of sharing, because what if the partner hates it? I say it doesn't matter. I say you have to realize that your partner is not your editor, and thank him (okay, or her) for the effort. And keep asking them to make the effort. I don't think it's important for your partner/family/best friend to love your work to keep loving you. It's important that they appreciate it and support it. I didn't get as much done as I would have hoped on the Workshop story as I would have liked this last week, but I did have the privilege of having everyone in the Workshop edit the new stuff for me. That was very nice. We are going to give a reading of our works in progress next Tuesday. This should be interesting. When I was thinking about what I wanted to do for this thing, I tried to hit all the high points of short story writing. Well, all the ones I know about. I think we talked about most of them. We talked all the reasons to write short fiction, we talked about some of the approaches we can use to tell a story, point of view, character--even a little bit about plot. Then we talked about editing, and even a bit about publishing. The very bottom of my list of things to talk about was readings. Everybody knows that in order to sell your words, occasionally, you have to read them in public. I think most writers have a love-hate relationship with preforming. On paper, sitting in the booth at your diner with your headphones in? Yeah, sure, that's the best. For me, that's when the writing sounds exactly how I want it to. In my head, each character has her own voice, and even the right soundtrack behind them. Now, standing in front of group of people, with my story in my hand? That's completely different. I can't shake the feeling that I'm going to fail the story because I know I can't make it sound like it does in my head-like it does when people read in for themselves. I know it's just going to be me, standing in front of a bunch of people, and who wants to see that? So why did I insist on the reading at the end of the Workshop? Because I know that it's important. As important as posting a blog each week, or advertising your latest publications on Facebook. Maybe even more. It's important to read your words to people, to build you audience. And, like everything, it's important to start where you're starting. So, if you're so inclined, come and give us a listen, okay? Okay, so here's the thing. My friend Kacey dragged me into this. She tagged me in a game called "Look". Yep, so you search for the word Look in your wip and stick that and the surrounding paragraphs onto your blog. Okay, well, my paragraphs can be kinda short so here's a hunk of stuff. And yep, it's from Iron Moon, just for you Kacey. James saw the glow of green eyes in Narin's reflection. He saw the twist of the black chain appear at the nape of his neck. “It's not the same.” Narin insisted. James kissed him again instead. Because it was better than lying. Okay, there you go. I am supposed to tag other people in the game, There are two things wrong with this. One: I don't know how to tag people, and also, I don't know many other people. So... um, Hey, Loren? Yes, it's really going to happen. 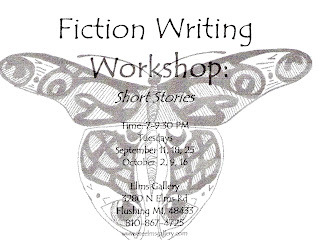 I'm going to teach a workshop on writing fiction this fall. I will be concentrating on short stories, but I welcome people who have only worked with long fiction as well. Using short stories as a learning experience is certainly a way to increase the writing skills you have in your tool box. Charles DeLint talks about the short story as the perfect place for experimentation, or as Brian Eno once said of music "It's the only place you can crash your plane with out getting hurt." Or something like that. The anatomy of a short story, how long, how short, etc. Writing exercises to get your pen moving. A reading at the end for friends and family to hear your very best parts. I'll even bring the humus and tea! So there you have it. I will be holding all this at the Elms Gallery in Flushing (see the flier above, and be impressed that I actually got it onto the blog). There are ten spots available as of now. So far it's been a pretty busy summer. In May we went to Wiscon, which, after missing it for three years, was great. I learned so much and collected so many story ideas it's hard for me to concentrate on what i'm supposed to be working on! It was also great to get out of my life for five days. It was hot, the food was amazing, and the panels were non stop. 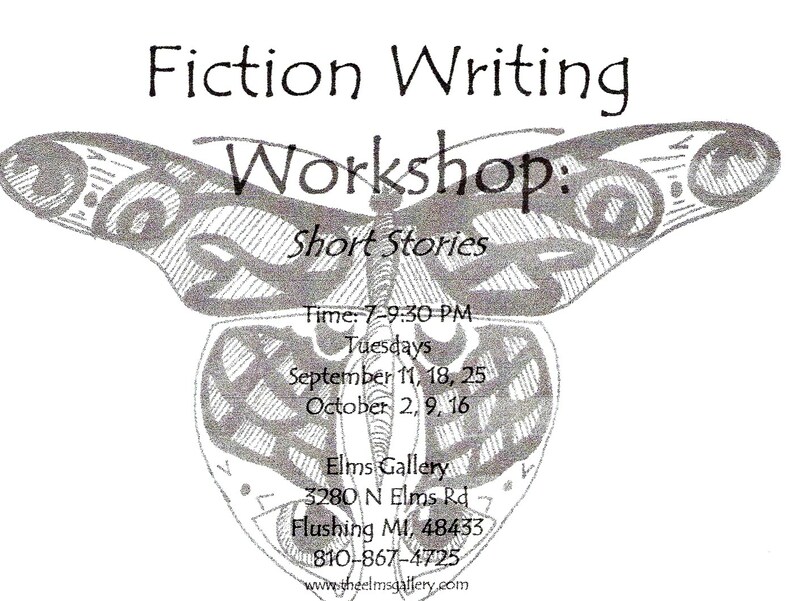 This fall I will be doing a writing workshop at the Elms Gallery in Flushing. www.theelmsgallery.com It will start on the second Tueseday of September and run for 6 weeks. I will post all the details as I have them, but I really looking forward to it! I belong to a writer's group that has been in existence, in one for or another for more than seventy years. It's true. It started, as a group of women, meeting in living rooms. They read and critiqued, all aloud. In the eighties, when I joined, meetings were being held in a church. They were still reading to each other. 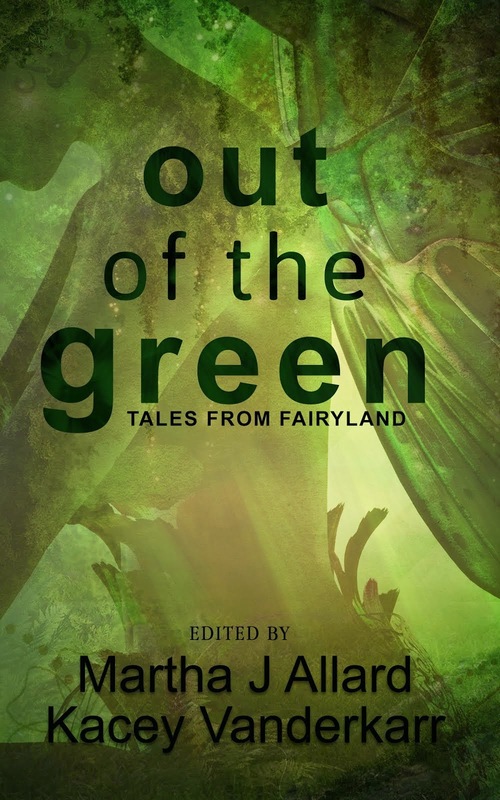 I thought all the stories were amazing, and I couldn't understand how they all found things to critique. Everything each member read sounded so perfect. Except when it came to reading my work. As a teenager everything I wrote was, well.. Teen aged. I loved every word of my Warriors meets Diamond Dogs meets Time Square influenced short stories. Stories that no grown up should have to suffer through. They did, though. Suffered through all of the awkward adolence-ness of my beginning writing, and made them into lessons for me. They taught me how to set a scene up, taught me how to describe things. (you can't have him open a refrigerator before you tell me it's there). They showed me the importance of verb choice. And, most importantly, they let me develop a critical ear. It took time, but eventually, I began to hear what they heard. All those little burrs, and big ones, in the rough drafts we dealt with. I could pick them out of my work, as well as other's. Because the truth is, there's a rhythm to fiction, a rhythm that you can't see with the eye. The ladies that welcomed me into the group are gone now. The group itself was in danger of completely dissolving. It was hard for me, because I've been spoiled. It doesn't do me any good to read to an empty room. No, now, after twenty-odd years, I need to hear my words up against an audience. I need to feel the moment I lose them before I can fix it. Then one day, another member of the group called me. She and I are the last of the old breed, really, the only ones that remember the "originals", or at least the ladies that were there when I started. She said she was writing, and that she wanted to get together again. I was eager to agree. I didn't know how much I missed it until she said, "I miss hearing the stories." Me too. Now we meet at Baker College. We are small, but steady. We are a handful of diehards, and some new members. I'm excited at the prospect of new stories, and new rhythms.